When my wife Denise announced to her family that we were leaving New York and moving to San Francisco, one of her aunts, a former SF resident, passed on to us a piece of advice that someone had once passed on to her; “live like a tourist,” she said. Simple. It was one of those moments where it feels like someone struck a gong right by your head. Of course. How else would you live in a new city? GONNNNNG. It was so profound that my first feeling, oddly, was melancholy. I wished that someone had given me that advice before I moved to New York six years earlier. Because if anything, I’d always done the opposite. Work came first. And I learned to judge and despise tourists the way that only New Yorkers can…”can you believe that guy just asked me for directions to the ‘big Christmas tree’” I’d scoff, as I put my head down and plowed through the crowd, not letting it dawn on me that I’d never truly seen the tree at Rockefeller Center either (except from the window of a cab that was taking me away from that nightmare). Only when I was faced with leaving NY did I realize all things I hadn’t done. Stuff that people from all over the world come to NY just to do. I never went to the Statue of Liberty, or to the top of the Empire State Building. I went to Central Park an embarrassingly few number of times, and can’t say I ever really tried to enjoy it. I went to Grand Central, but only because I had to. I never set foot in the NY Public Library, though I had drinks out back there at least a half dozen times. I never went to Famous Ray’s, nor do I even know which one is the real Famous Ray’s. The cool touristy things that I did do were often at the behest of people who came to visit. My first trip to Broadway was because my aunt made me go to see Phantom with her. If memory serves, I griped about it, a lot, but eventually let my mom talk me into it. I probably ought to thank her for that. The one time I visited Ground Zero was right after I moved to the city, when an out-of-town friend asked me to take him there. I said ok, and insisted that we walk all the way from 35th and 1st. I never admitted to him (until now) that it was because I didn’t really know exactly where it was or which trains it would take to get there. And I was too proud to ask someone. So we headed out on a vaguely southwesterly course. It took us about an hour and a half. I should have been more tourist-like. “Living like a tourist” I’ve come to appreciate is not just about seeing new things, it’s also about being unselfconscious; of our ignorance and of our enthusiasm. Those people we all make fun of don’t even know we’re making fun of them. And get this…<gasp>…they don’t even care! Imagine that. It’s freeing, really. I wish I had known. Because as I started to think about New York, I was forced to think even further back to the 7 years I spent in Philadelphia, where I never went to see the Liberty Bell or Betsy Ross’ house or Independence Hall. I never even ran up the ‘Rocky’ stairs (let alone enter the Art Museum that stands at the top of them). I was too lazy to make the effort, and too cool to be impressed. Which brings me to today. I’d like to say that I did exactly as I was told, and lived like a tourist here in SF. But I didn’t. We started out strong, with trips to Alcatraz, hikes in the Presidio, and ballgames at AT&T Park, but then…we stalled. We fell into routine. Wasn’t completely our fault, of course. First of all, we had a baby. Second, living like a tourist often means being around other tourists. And my years of urban training tells me that that’s a bad thing…as if at any second I could get dragged into a chain restaurant and forced to eat unlimited salad and breadsticks (as if that would really be that bad of a deal, come to think of it). But a while back Denise and I had a serious talk about San Francisco and what we hoped to get out of it. We decided it was time to remember her aunt’s advice. We aren’t leaving anytime soon, but when we do, unlike Philly and New York, I want to know that I lived it all. So we started a SF bucket list; all the things, big and small, that we want to do while we are here. We’ve already started checking boxes. We went to Napa to try new wines. 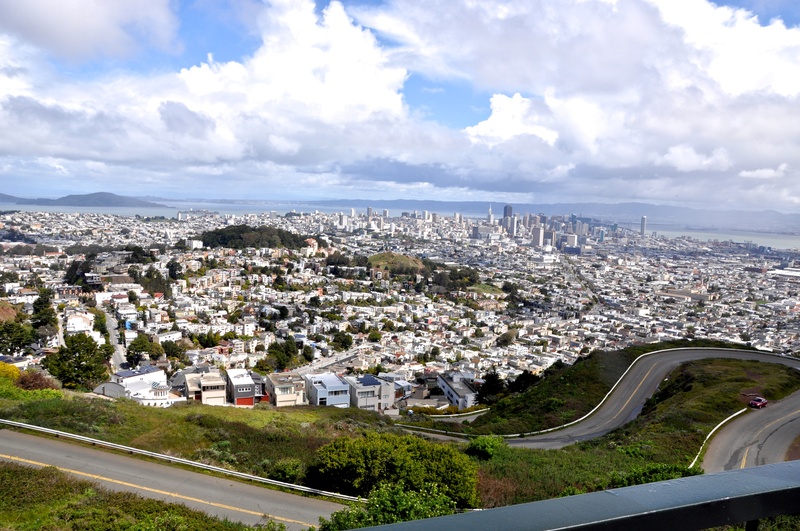 We finally drove up to Twin Peaks, just to enjoy the view of the entire city (see pic). We went to Fisherman’s Wharf for Dungeness crabs. We went to see the Buffalo in Golden Gate Park. We drove down the coast to see Mavericks. And today we’re going shopping in Union Square (an activity I would have gladly passed on). It’s been amazing. We’re making memories, and someday we’ll have them to share with Madison. She won’t remember, but she’ll see herself in the pictures. And, guess what, I’m going to flag down hurried locals and ask them to take those pictures for us, so that we can all be in them together. Sorry. It’s just something us tourists do. Hopefully, they’ll get it. Thanks Aunt Julie! Great advice Adam!! I need to do this myself. . .thanks! Excellent bro. Great outlook, and funny. Look forward to more. We all do this……”we’ll do it someday”, and they the years slip by. Even in your own town or closeby city, there are treasures right under our noses. But we spend time and money to go look at something “exciting or historical” on our free time. Something wrong here. Thanks for the wake-up call. Thanks guys. I’m glad I decided to share. A lot of the comments I’ve gotten have been positive. Folks seem to have appreciated the reminder. I know I did. Great writing Adam! Don’t ever forget your touristy nights of karaoke in NYC! Thanks, Nicole! And I liked to think of myself as more of a local (legend) when I did karaoke in NYC. Hi…I somehow stumbled across your blog tonight…what a good read! Twenty one years in NYC and I still haven’t seen all the sights…I’m making myself a NYC bucket list!! That’s awesome. Thanks Beth! Can you share what’s going on the list? That was lovely! And my mom (Denise’s Aunt Julie) was really touched that you shared the blog piece with her. Guess it’s time (after 13 years) to start living like a tourist in Dallas…. Thanks Krys! I’m glad your mom liked it. I really am very thankful she shared that advice with us. Something we’ll remember no matter where we go next. Dallas is a great city, too. Giddyup! I ALSO LIVED IN MANHATTAN, AND GOT MARRIED, AND MOVED TO SAUSALITO! 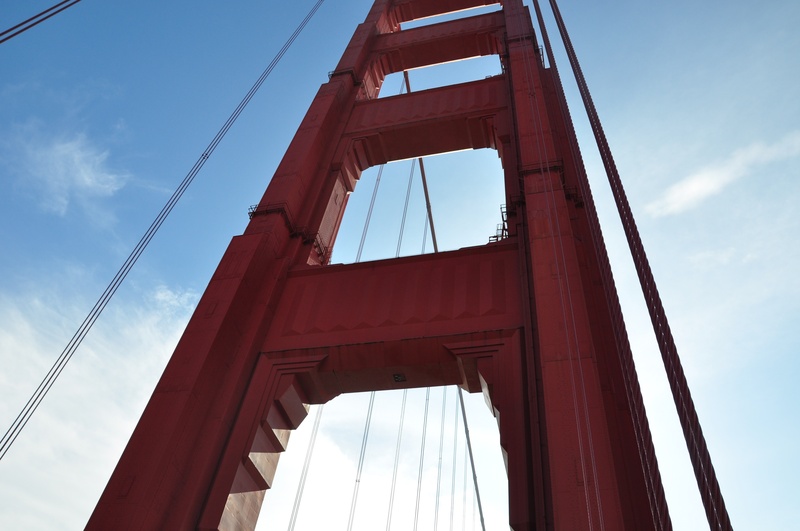 !..WHICH IS RIGHT ACROSS THE GOLDEN GATE BRIDGE FROM SAN FRANCISCO!! WE NEED TO BE LIKE TOURISTS, ALSO!! AND ALSO TOMMY’S JOYNT, ON VAN NESS, IS A FAVOURITE PLACE ENJOY!! Thanks! Have been meaning to try Tommy’s for 2 years now. I think that’s just the push I needed! When I first moved to DC I promised myself I would do it all. I am glad to say I have done most of it – top of the Wash Monument (but it took me 17 years to convince myself to stand in that line. By then my kids were old enough to enjoy and remember it so not a bad wait and I got to experience it with them for the first time), all the Smithsonians, The White House (pre 911), I have even been on the Senate floor and peeked inside JFKs desk. Live it! Just happens I am on my way to SF on Friday so thanks for the tourist advise. I will take you up on it. Awesome! When I was a kid, we lived outside of DC for about a year. I still appreciate some 25 years later that my dad put in the effort to show us around the town. There were some really amazing things to see. Even back then I felt like I could get lost in the Smithsonian for a month and never get bored. We ended up leaving SF a little sooner than I expected, so I’m extra glad that I made seeing all of it a priority. Enjoy your trip! !